Darrel Phillips, of Griswold, told the NBC Connecticut Troubleshooters that he and at least six other relatives have had Lyme Disease multiple times. His youngest son, Liam, was diagnosed with Powassan (POW), a rare tick-born disease, at just 5 months old. According to the Center for Disease Control, approximately 75 cases of POW virus disease were reported in the U.S. over the past 10 years. Liam’s diagnosis was the first confirmed case of Powassan in the state, and had the boy’s mother, Desiree Phillips, scared to let her two young sons out of the house for a while. 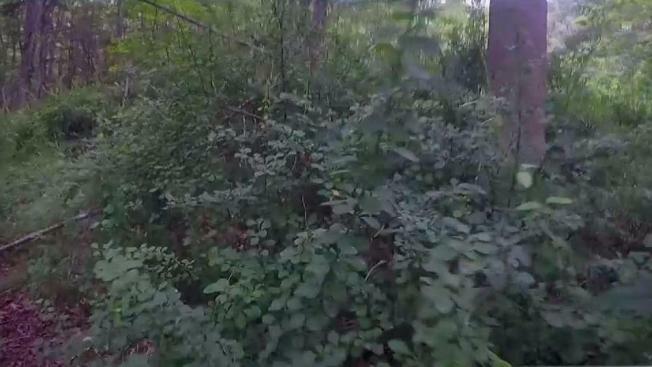 In the woods outside the Phillips’ home, the family said they have found acres of Japanese barberry growing wild. It is recognized by the state of Connecticut as an invasive species, but is a shrub in home gardens and commercial landscapes, such as those outside malls, gas stations, and restaurants. Dr. Williams’ team has found dense thickets of Japanese barberry all over the state and said it has invaded ecosystems including forests and wetlands. Their research showed an acre of forest containing Japanese barberry averages a Lyme Disease-carrying tick population that is 12 times higher than forest without it. The spread of Lyme Disease in barberry thickets is due to white-footed mice, common carriers of the bacteria that causes Lyme Disease, which take shelter amongst the barberry’s dense and thorny branches. One infected mouse passing through can transfer bacteria to any number of ticks, which then pass the infection to their next host. Japanese barberry thickets are also warmer and more humid than is normal, making it easier for ticks to survive. Dr. Williams’ research has shown controlling barberry in the woods can reduce the infected tick population by as much as 60 percent, welcomed news to the Phillips’ family. They cannot be sure if the barberry thickets surrounding their home contributed to their son’s bout with Powassan, but Desiree Phillips decided to take action. The Phillips’ plan to clear-cut as much of it as possible. “The more we can get rid of it, the better off we will be,” Desiree Phillips said.